“A STRANGENESS IN MY MIND”, Orhan Pamuk’s ninth novel, is both an unforgettable love story and a modern epic. Mevlut Karataş, the novel’s hero, is a street vendor who sells boza, a traditional Turkish beverage. 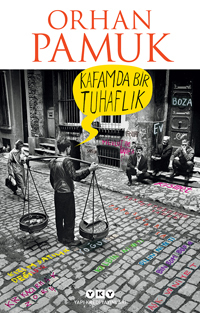 The novel follows the love story between Mevlut and his girlfriend whom he wrote letters for three years, as well as Mevlut’s life in the streets of Istanbul throughout a period that spans over four decades, from 1969 to 2012, during which Mevlut works in a range of different jobs by day and sells boza during winter nights. Throughout these decades, Mevlut witnesses the various transformations the city, the people and Turkey in general undergo. All the while, Mevlut often wonders what the source of this “strangeness” in his mind is – a strangeness that makes him different from all the others. “A Strangeness in My Mind”, a story told from the perspectives of various characters, is destined to be one of the most widely read novels of Pamuk, as well as one of his greatest achievements.